Freezer-Aisle News, Almond-Milk Soft Serve, Protein Finds & MORE! 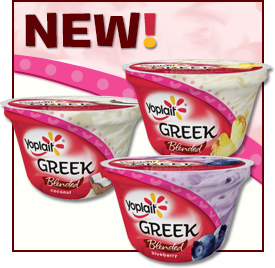 Yoplait Greek Blended Yogurt - We buzzed about it before, but now this stuff is officially on shelves! Yoplait has reformulated its Greek yogurt, and we can't keep our spoons out of it. Choose from Blueberry, Pineapple, Tangerine, Vanilla, Coconut, and Strawberry Raspberry. Each 5.3-oz. container has 140 - 150 calories, 0 - 1g fat, 50 - 80mg sodium, 22 - 23g carbs, 0g fiber, 18 - 19g sugars, and 11g protein (PointsPlus® value 3 - 4*). Two yums up, Yoplait! Gorton's Simply Bake - Taking a page right out of the Hungry Girl playbook, this frozen fish comes wrapped in a foil pack! Choose from Signature Seasoning Tilapia, Garlic Herb Butter Haddock, and Roasted Garlic & Butter Salmon. Each fillet has 120 - 140 calories, 2.5 - 3g fat, 450 - 570mg sodium, 3 - 8g carbs, 0g fiber, 0 - 1g sugars, and 18 - 21g protein (PointsPlus® value 3*). The instructions are in the name: Simply bake! New Varieties! Van's Natural Foods Gluten Free Baked Crackers - We flipped for this line of crunchtastic crackers a while back, and the latest varieties are just as AMAZING as the originals. There's The Perfect 10 Crispy Six Whole Grain + Four Seed (salty snack excellence) and Fire-Roasted Veggie Crispy Whole Grain (fantastic veggie flavor baked right in). Chomp on 12 crackers for 130 - 140 calories, 4 - 6g fat, 125 - 170mg sodium, 20 - 22g carbs, 2g fiber, 2 - 3g sugars, and 2g protein (PointsPlus® value 3 - 4*). Find these STAT! On-the-Go Freezy Treats Get Unconventional Upgrades! 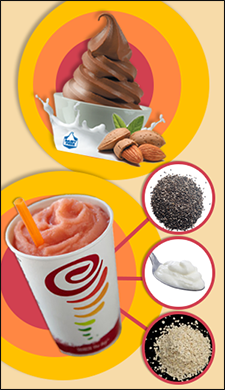 Quirky New Boosts at Jamba Juice - If you prefer identifiable add-ins to powdered supplements, there are three new boost options for you. Go for the Chia Seed Boost (a 35-calorie scoop of seeds boasting 3g fiber), Greek Yogurt Boost (a 25-calorie dollop of protein-packed, fat-free yogurt), or Quaker Whole Grain Boost (60 calories' worth of finely ground, fiber-rich oats). WOOHOO! We recommend starting with a Make it Light smoothie. In Cereal! Our pals in the Kashi kingdom have a new cereal, and it's exploding with protein... 11 grams per 1-cup serving! The GOLEAN Vanilla Graham Clusters have 170 calories and 1.5g fat per cup, not to mention 9g fiber (PointsPlus® value 5*). Graham-tastic! In Pancake Mix! - MAJOR find, people... Get your hands on FlapJacked Protein Pancake Mix. It comes in Buttermilk (our favorite), Banana Hazelnut, and Cinnamon Apple, and each 1/2-cup serving has 180 - 200 calories, 2.5 - 4.5g fat, and a tremendous 15 - 17g protein (PointsPlus® value 4 - 5*). It's mainly available online and a tad tricky to prepare, but it's TOTALLY worth the effort! BREAKOUT FIND! 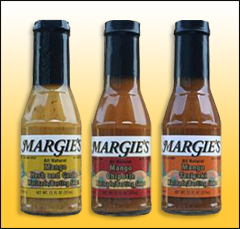 These mango marinades from Margie's are majorly amazing. (Say that three times fast!) They're incredibly tasty, all-natural, and low in calories -- a tablespoon has only 15 - 20 calories. They come in Mango Herb and Garlic, Mango Chipotle, and Mango Teriyaki. We LOVE using them as sauces on cooked chicken and steamed veggies. Order online or find a bottle near you. ***Need more proof that sleep is important for weight management? A recent study links sleep deprivation to fatty-food cravings. Researchers from UC Berkeley exposed participants to a variety of food images, ranging from strawberries to pizza. The more fattening foods ranked as significantly more desirable when participants were sleep deprived. Time to hit the pillow, people. ***There might be something to the adage "You are what you eat"... Results of a recent study suggest that thrill seekers are more likely than others to enjoy spicy food. So if you're the type that puts hot sauce on everything, chances are you're quite the daredevil! ***Wish you could peruse Facebook and make dinner reservations with one handy phone app? Good news: The social media site recently struck a deal allowing diners to book with OpenTable while using the Facebook app. Way to make things easy, Zuckerberg! ***Finally, it would appear that food is the latest medium in the art world. Click and scope out the beautiful plate art one mom-turned-Instagram-star is serving up. How could anyone eat something that pretty? And that's all we've got. HG out! News only stays new for so long -- click "Send to a Friend" to share it now! There's some debate as to whether National Soft Ice Cream Day was yesterday, August 18th, or if it's today, August 19th. We say there's no time like the present to try TCBY's latest offering!